If anyone would know what it's like to show up late to a party it's the man that worked on Duke Nukem Forever for over a dozen years. 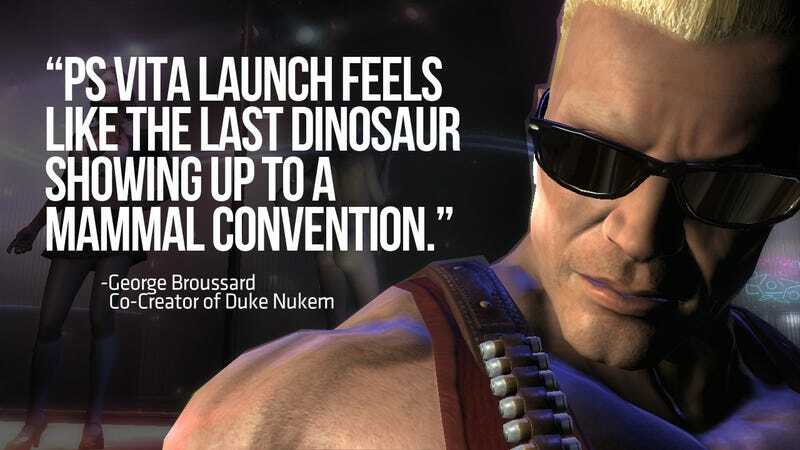 Fanning the flames of the smartphone versus dedicated gaming handheld debate via Twitter yesterday, Duke Nukem co-creator George Broussard compared the launch of Sony's latest shiny gaming toy to the last remnant of Earth's one-time reptilian masters stumbling into monkey town. At least that's how I am imagining it. The monkeys are all standing on two legs, crafting tools, and drinking martinis; the dinosaur (I'm thinking velociraptor) starts flailing its tiny arms in frustration. Of course the last dinosaur showing up at the mammal party could still do a great deal of damage, unlike Duke Nukem Forever, released last year after being handed off to Gearbox Software to reviews that amounted to pages of repressed laughter. Where the comparison really falls through, however, is the fact that the Japanese love giant lizards.